Number of rotors 8 pcs. Number of arms per rotor 6 pcs. Yet another PÖTTINGER innovation: The unique swept-back tine arms guarantee a tidy distribution pattern. High performance is built in to our mounted and trailed HIT tedders. 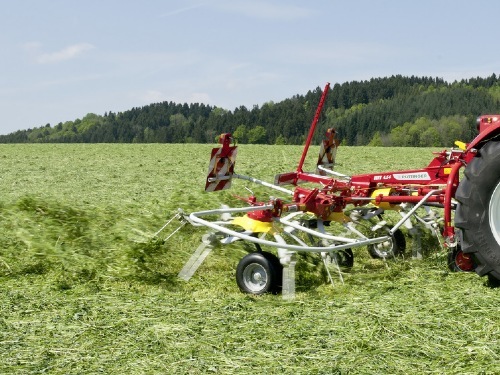 Rotors with a diameter of 1.30 m and five arms are ideal for young, short forage. Rotors with a diameter of 1.42 m or 1.67 m and six arms are designed for different working widths and operating conditions. The curved shape of the tine arms is unique. Guiding the tines in a sweeping movement means less stress on the bearings. At the same time the trailed tines move more smoothly, are softer and handle the forage more carefully. 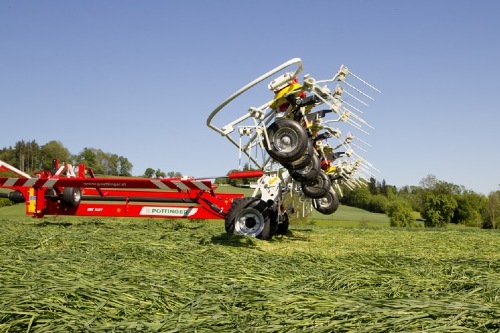 The curved shape prevents forage from building up in the tine arms and wrapping around the rotors. The bolted mounting ensures a secure fit. A tine security system is standard - to cover all eventualities. An arched mounting supports the tine springs. Plenty of space between the tine springs and the tine arms allows for the best elasticity and movement. 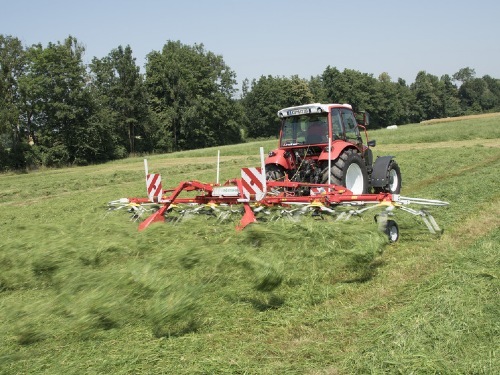 Offset tine lengths pick up the forage uniformly and contribute significantly to improved tedding quality. Choose between two angles by rotating the mounting through 180°. The cleanest possible forage is guaranteed. The rotor plates are made of heavy-duty, thick-walled pressed components with precise placement for the tine arms. In addition, the tine arms are also bolted to the rotor hubs to ensure an extremely secure mounting. The tines and tine arms are subject to the highest stress during tedding. The solid flat bar tine arms feature indentations to ensure that the tines remain securely in place. Ground tracking and forage protection are the key objectives of HIT rotary tedders. An optional jockey wheel on the pivoting headstock tracks the ground immediately in front of the tine path and responds to each undulation. 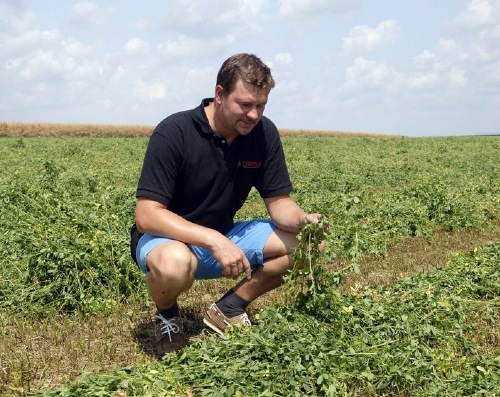 The result: Clean forage, lower raw ash content and improved livestock health. The jockey wheel guides the rotors over bumps in the ground. This ensures that the working depth is always set correctly. You are now able to drive faster and can achieve a higher output as a result. The sward is protected and the tines last much longer. The additional jockey wheel is especially recommended for working on slopes. The jockey wheel can be mounted in several different positions to the left or right using the pin-in-hole matrix on the headstock. The top link connects to the slotted hole on the headstock. No tools are required to adjust the height. On trailed machines, the jockey wheel is mounted on the drawbar. 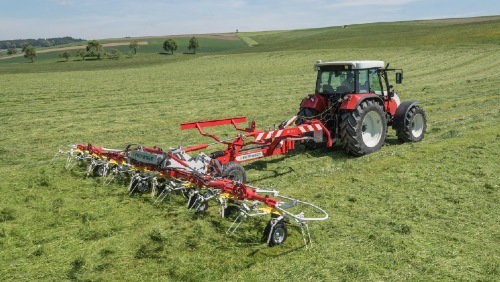 Actively setting the wheels at an angle causes the tedder to run diagonally so the forage is directed onto the mown area. Neighbouring crops remain untouched. Because the wheels can be set to the left or right, fenceline tedding can be activated in any driving direction. The wheels on all four rotors are set individually by hand. All the wheels can be adjusted conveniently from the tractor seat by a double-acting hydraulic cylinder into the positions left, centre, right. The wheel position indicator is clearly visible from the driver's seat. If you do not require a fenceline tedding system, the wheels are mounted securely to the rotor casing as standard using roll pins. Sealed single and double constant velocity joints ensure consistent, smooth, backlash-free transmission. This ensures that the tines pick up the crop at a precise frequency and distribute it evenly. At the same time, they can be rotated in any position, eliminating the possibility of operator errors. Clevis-type frame hinges provide each rotor with the freedom of movement for perfect ground tracking. Fitted with plain bushes, they are easy to lubricate. Large gears and bearings ensure smooth operation. The closed angular gear units are equipped with grease lubrication systems. The joints are mounted on a splined shaft. The large 16 x 6.5-8 flotation tyres on each rotor ensure smooth running and protect the sward, even over soft and bumpy ground. Each wheel is fitted with a cover that also serves as anti-wrap guard. The two inner rotors on the HIT 8.81 and HIT 8.91 are fitted with 16 x 9.50-8 flotation tyres. This improves weight distribution during operation and conserves the soil. The rotors can be moved into three positions without the need for tools. 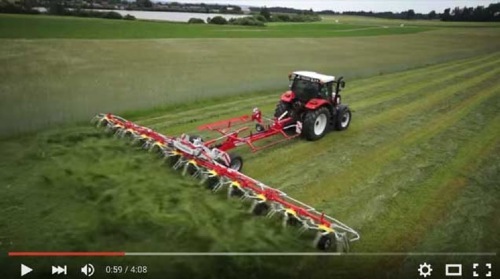 You can adapt the rotors to the forage conditions quickly and easily. A uniform and tidy spread pattern is ensured as a result. CIP and powder coating guarantee elasticity and durability. Together with attractive colours and modern design, a high resale value is ensured. 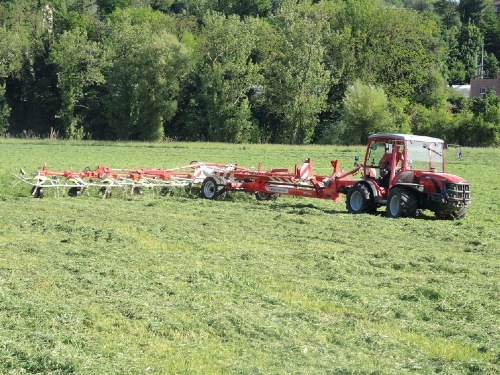 The trailed HIT 4.54 T delivers professional tedding with small tractors. At the headland and during transport, the rotors are raised by a hydraulic cylinder inside the drawbar. All wheels are pivoted by hand for fenceline tedding. The HIT 6.80 T is equipped with an additional chassis that runs behind the machine during operation in the field. Our six-rotor tedders are easy to operate hydraulically. You can also specify the hydraulic fenceline tedding system. HYDROLIFT is fitted as standard. 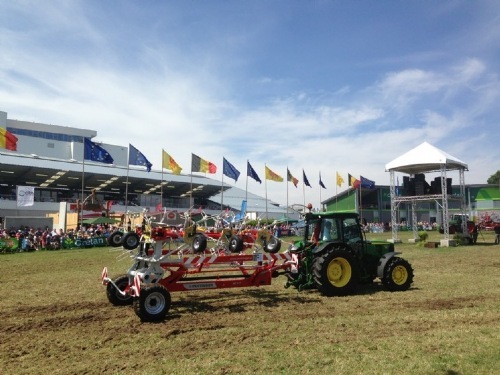 The outer pair of rotors are raised to the limit stops during turning, while the transport chassis lifts the tedder clear of the ground. 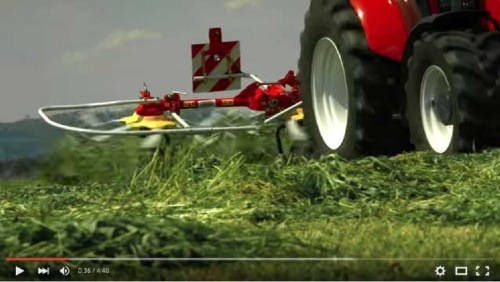 The trailed tedder with eight rotors for high performance with smaller tractors. Ground tracking and forage protection are the key objectives of the trailed HIT 8.91 T. An optional double jockey wheel on the drawbar tracks the ground immediately in front of the tine path to guide the rotors over the contours. 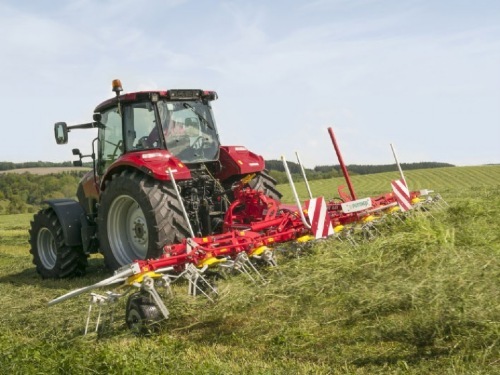 The tedder is attached to the lower linkages of the tractor by a robust yoke to provide stability during transport. The wide chassis is fitted with 260/70-15.3 tyres. During operation, the chassis is folded hydraulically over the rotors. The two inner rotors on the HIT 8.81 and HIT 8.91 are fitted with 16 x 9.50-8 flotation tyres. This improves weight distribution during operation. The whole machine can be operated using one double-acting connection. Sequential stepping valves control all the functions one after the other in the right order.